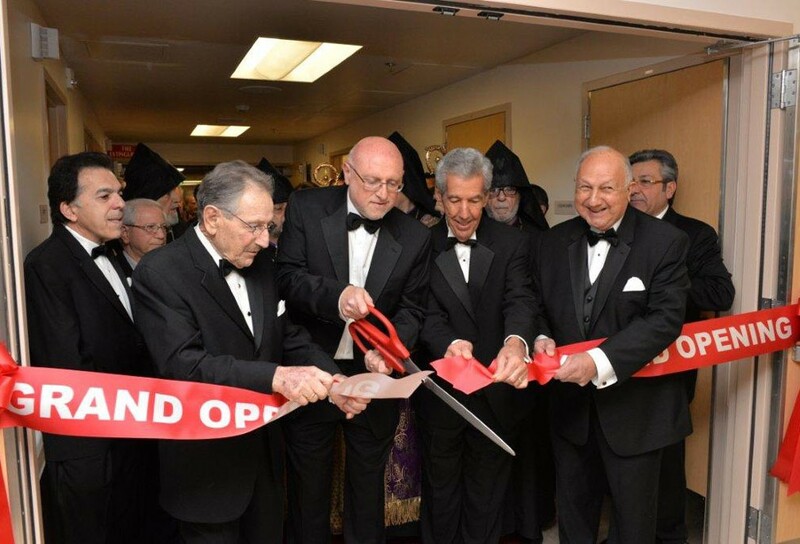 February 8, 2014 marked the official grand opening of the Avakian Wing of the Skilled Nursing Facility of Ararat Home of Los Angeles, Inc. adding 58 much-needed beds. Clergy, dignitaries and over 500 benevolent sponsors and supporters of the Home attended the Black-Tie Jubilee Dinner Dance. The historic event began with the official ribbon cutting ceremony by Chairman of the Board of Trustees and Co-Chair of the Building Committee, Joseph Kanimian, Esq., past Chairman of the Board and Co-Chair of the Building Committee, Mr. Nazar H. Ashjian, Jr., past Chairman of the Board and former Chairman of the Building Committee, Mr. Armen Hampar, and executor of the Avakian Family Trust, Mr. Robert Taylor. Greeting the guests in true Armenian fashion, beautiful hostesses dressed in traditional Armenian costumes served brandy and chocolates as they were ushered into the new wing. A capacity crowd included religious leaders: Archbishop Hovnan Derderian, Primate of Western Diocese of the Armenian Church of North America; Archbishop Moushegh Mardirossian, Prelate of Western Prelacy of the Armenian Apostolic Church of the United States; Reverend Joseph D. Matossian, Armenian Evangelical Union of North America; Very Reverend Monsignor Andon Atamian of the Armenian Catholic Eparchy; many archbishops and reverend clergy accompanied them. Our religious leaders commended Mr. Kanimian for his exceptional leadership and expressed appreciation to the Board, administration and staff for their hard work and dedication in superbly providing a nurturing, stimulating and safe environment for our elders. ©2017 Ararat Home of Los Angeles, Inc.